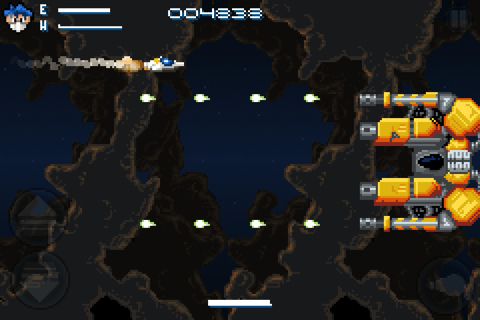 Neoteria is a side-scrolling shooter for iPhone, iPod touch and iPad that is reminiscent of classic arcade favorites like Gradius and R-Type, although it offers several modern features that help add a modern twist to the gameplay. In their latest iOS offering, Orange Pixel Interactive puts gamers’ reflexes to the ultimate test with dozens of difficulties to shoot and pilot their way through. Those who might be looking for a deep, engaging story should probably look elsewhere though, as Neoteria offers little in the way of narrative or plot. What players will find in this app however, is a very well produced action game that offers tons of thrills. Neoteria really does a great job of integrating the iPod Touch into its control setup, as figuring out how to pilot the spaceship and firing its lasers is incredibly easy and straightforward. Players who remember frantically pushing the same button over and over will be right at home here, as there are no complex button combos to learn or special moves to execute, players only need to avoid the enemy’s attacks and do as much damage as they can as quickly as possible. The newest release has also added a 360 degree control option for added value which feels like it could be improved upon going forward. 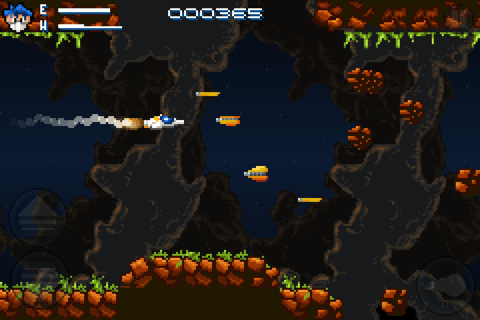 Neoteria’s graphics are a throwback to classic 16-bit shooters, and as such they’re meant to evoke a feeling of nostalgia. The program definitely succeeds in this attempt, but players who are used to newer, shinier graphics might be a bit underwhelmed by the game’s graphic style. However, for players who grew up playing games on Nintedo or Sega Genesis systems, the graphics do a superb job of emulating the style of games from that time period. Neoteria offers a terrific value for the money, due to the fact that it comes with dozens of levels for players to blast their way through. Neoteria will especially appeal to gamers looking for a fast paced old school bitmap shooter boasting a retro 80s style arcade soundtrack. The application offers several difficulty levels which are sure to keep gamers challenged for quite some time. Players can also find plenty of unlockable weapons and ship upgrades, which gives quite a few customization options to experiment with. One of the big downsides to the app is the fact that players are given infinite lives. No matter how difficult a stage may be, a player will eventually be able to succeed by sheer tenacity instead of skill. This feature is sort of a double-edged sword: On one hand, it ensures that players will never get stuck on a particularly hard part in the game. On the other hand, it makes it possible to beat the app on even the hardest difficulty in a relatively short amount of time. A limited number of extra lives would have definitely made this iPhone app last much longer and ensure that players got a little more enjoyment out of the title. AppSafari review of Neoteria was written by Joe Seifi on March 20th, 2012 and categorized under Action, App Store, Arcade, Games, Scrolling Shooter. Page viewed 4000 times, 3 so far today. Need help on using these apps? Please read the Help Page.